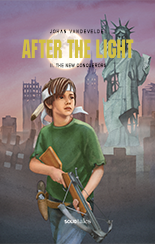 The foreign rights of the Solid Tales books are available through the author. English language proposals with more detailed information can be provided on demand. 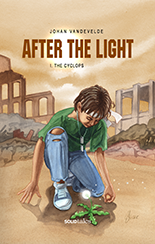 German proof translations of 'After the Light 1: The Cyclops' and 'Robin Roover & the Ship that Sank Twice' are available. You can contact Solid Tales directly with this mail form. A century after a global thermonuclear war, the earth is a devastated wasteland of sand and ruins. Fresh uncontaminated water is worth more than a human life. 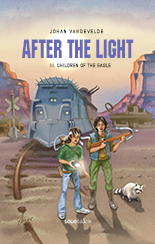 Eleven year-old Boran and his mother Nalea travel in an old truck through the remnants of Europe in their quest for drinkable water. After a short stay in a waystation, Nalea carries a secret with her that she doesn't even want to share with her own son. When they are ambushed and Boran's mother is taken prisoner by a merciless gang of pirates, Boran is wounded and left to die in the desert. It's the young vagrant Mattia who saves his life and together they decide to go after the pirates to save Boran's mother before she tells the Cyclops what he wants to know. An unconventional mix of "Treasure Island" and "Mad Max"
After the adventures in part 1, the fighting is over for Boran and his friends and family, now that they have found the legendary desalinization plant of West End. A small settlement has emerged near the seashore and the days of danger and violence seem history. Life isn't easy for twelve year-old Danny. His parents are divorced and on his new school he's ruthlessly bullied by Marco. When Marco intentionally breaks Danny's watch - a beloved heirloom of his grandfather - Danny goes mad with anger and they fight. The school principal invites the parents of both boys for a talk. Contrary to their sons, Marco's dad, who's a widower, and Danny's mom, immediately get along pretty well. They even fall in love and start dating. Things get serious for arch-enemies Danny and Marco. If their parents would decide to marry the boys would become brothers. And that's something they want to avoid at all costs. Danny and Marco sign a contract in which they promise to work together to try and destroy the relationship between their parents. But love is not that easily destroyed... and friendschip can be found in the most unlikely places. 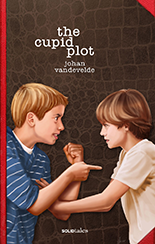 The Cupid Plot was awarded first runner up prize in the Flemish Children's and Youth Jury in 2013. Foreign Rights for all languages other than Dutch are available. Robin is obsessed with ciminal cases and dreams of becoming a great detective. In the summer holidays his dad unexpectedly takes him on a luxury cruise to the Bay of Biscay. However, Robin's prospect to have a fun holiday with his dad, whom he hasn't seen for a very long time, melts away. Ludovic Roover brought his work with him and is on a strict deadline. Left to his own devices, Robin befriends the Dutch boy Pieter-Jan, who is making the cruise with his mother. But when Robin discovers some fishy stuff going on with the magician on board of the ship, his detective senses start to tingle. Before they know it the boys get up to their necks into a very dangerous case with a nameless passenger, an unsolved murder mystery and a ship that sank twice. 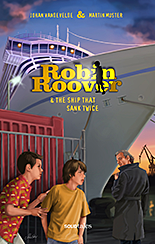 Robin Roover and the Ship That Sank Twice is an exciting and funny adventure in the tradition of Enid Blyton's novels. Classic detective stories in a contemporary style for kids 10 and up.